Looks: Big, chunky and misshapen buds that look like they went through the Frosted Flakes cereal machine. Smell: Orange and grapefruit peel. Taste: Sharp, tangy and expansive smoke. Tickles the nose. Effects: Quick over-all rush upon exhale may leave you completely incapacitated for a few moments. Powerfully strong body high, especially in the eyes, but without a sleepy feeling. Mostly energetic and cerebral, leaving you spacey and creative for 2-3 hours. Good for daytime use, but you might have a tendency to forget what you were doing and lose things. Good Strain For: Stress relief. Joint and muscle pain. Looks: Dense, Light Forest Green, Golden Trichomes That Cover the Whole Flower, and Dark Orange Hairs. 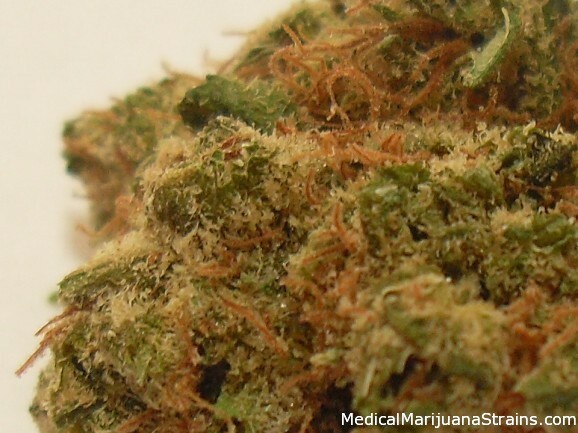 Good Strain For: Depression, Bi-Polar Disorder, Headaches, Mild Pain, ADD/ADHD, and Anxiety.